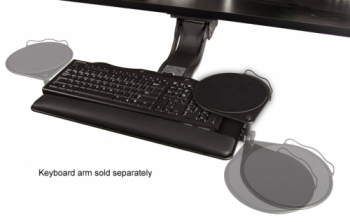 Merlin - 20" Keyboard Platform - Keyboard Arm & Tray - "Merlin Mouse: The Power To Choose"
The very latest in "personalized mouse positioning" the Merlin Mouse makes it possible for a mouse user to micro adjust every conceivable aspect of mouse positioning which is so critical to personal comfort and safety. Given the choice, no two users prefer to use their computer mouse in the exact same position, yet existing technology has been static and has forced users to do just that. Well the Merlin Mouse makes that a thing of the past. It is now possible to adjust the following instantly and without tools: the handedness (left/right), the vertical position (above, below or level with) relative to the keyboard, the horizontal position (closer/further) relative to the keyboard and user, the fore/aft position to achieve the perfect reach condition, and angle setting to offset any keyboard mechanism angle being used and maintain a perfectly level working surface. This produces an infinitely customizable mousing solution that results in the lowest-stress and lowest-risk mousing postures ever possible.